"Classic oatmeal raisin cookies make tasty after-school snacks or lunchbox treats." In large bowl, beat butter and sugars on medium speed of electric mixer until creamy. Add eggs and vanilla; beat well. Cool 1 minute on cookie sheets; remove to wire rack. Cool completely. Store tightly covered. Substitute 1 cup semisweet chocolate chips or candy-coated chocolate pieces for raisins; omit cinnamon. Substitute 1 cup diced dried mixed fruit. HIGH ALTITUDE ADJUSTMENT: Increase flour to 1-3/4 cups and bake as directed. Made half of the recipe and got 20 cookies. Easy, simple and delicious! Will make again. Update 03-27-19 Still hubbys favorite cookies! 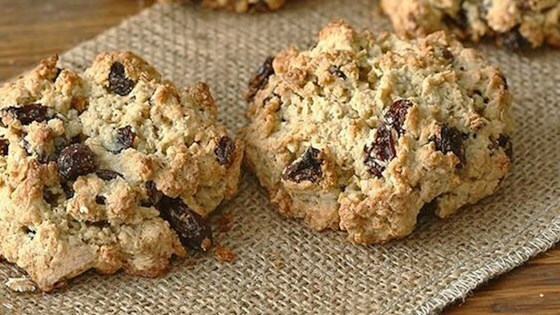 Still the best oatmeal raisin cookie recipe! Very easy to make. These are sooo dry. they just don't taste good. Only change I made was to use golden raisins and added a 1/2 teaspoon of nutmeg. The flavor was awesome. This is my new favorite cookie. I drizzled a little powder sugar icing on them. Magnificent!